Pizza Recipes delicious Japanese-style Okonomiyaki -If you want to enjoy the delicious food with a taste of the country's sunrise okonomiyaki including one that must be sampled. This food made ​​of wheat flour mixed with water or dashi to make dilute. After it was added to a wide variety of fields such as cabbage, seafood, eggs or meat chicken . 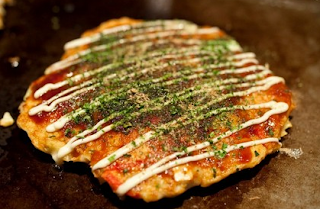 Okonomiyaki itself means "toping like" so you are free to choose the desired topping before baking it. In Japan, okonomiyaki is usually eaten with a kind of flat spoon called kote are also used when cooking as inverting the dough. One of the most delicious okonomiyaki is Kansai style okonomiyaki. Its main characteristics are the use of chopped cabbage in a batter of flour before frying. But now there are a variety of fields that can be adjusted to taste. You will be free to choose stuffing beef, shrimp, onion, kimchi, clams, mocha, cheese to corn and pickled red ginger or commonly called benishoga . You also can use a variety of other creative fields such as salmon, mushrooms or more before grilling okonomiyaki in wok or teppan . Want to create your own okonomiyaki? Here are ingredients and simple way of making up can be enjoyed up to 4 people. 1 seaweed or nori sheets measuring 10 x 10 cm were then cut into ½ x ½ cm. Take eggs and then whisk until smooth. After wrapping, put the flour and stir until blended. If it is flat then you can insert nori, cabbage, cheese, Japanese soy sauce and sake then stir again until blended. Heat a wok teppan or the size of 18 cm a covered over low heat. Do not forget to rub the pan with a little cooking oil. Pour the batter in the pan and then averaged. Sprinkle salmon with evenly then close. Okonomiyaki cook until cooked through. Once cooked, remove from heat and sprinkle benishoga or red Japanese pickled ginger on it while still hot. 0 Komentar Untuk "Pizza Recipes delicious Japanese-style Okonomiyaki"